Muppets Most Wanted is anything but. Muppets Most Wanted is anything but. Like so many movie sequels it doesn't come close to the original, or in this case, the first movie in the most recent reboot of the Muppets. Watching the Muppet show growing up was always fun and I am inclined to love almost anything Muppets but this sequel just wasn't good. I kept looking for something, anything, to redeem the movie in my eyes but I simply couldn't. Muppets Most wanted picks exactly where the first movie ends and leaves the cast to wonder "what's next". While The Muppets try to come up with new ideas. Dominic Badguy, played by Ricky Gervais (The Office, Night at the Museum), pitches the idea of world tour which Kermit loves. What Kermit doesn't know is that Dominic works for the Most wanted criminal in Europe, Constantine. As you would expect, Kermit and Constantine switch places so Kermit ends up in Jail while Constantine travels around the World stealing artifacts in a grand plan to ultimately steal the Crown Jewels. While Muppets most wanted has some great casting including Tina Fey (30 Rock, Mean Girls) and Ty Burrell (Modern Family, The Incredible Hulk) and numerous cameos including everyone from Ray Liotta (Goodfellas, No Escape), to Jemaine Clement (Men in Black 3, Rio), to Tom Hiddleston (Thor, Avengers) and Tony Bennett, Lady Gaga and Josh Groban, the script isn't funny enough to make them all look good. With so much source material and talent Muppets Most wanted was truly a let down. I can say one of the only times I laughed out loud was when during a wedding scene a character asked for an usher and Usher [Raymond] popped in. Included in the disappointment of this film were the musical numbers. The first Muppets movie had some great songs including "are you a muppet or a man" but this second endeavor failed to produce any worthwhile tunes. Even a dreamy, ballad duet between Miss Piggy and Celine Dion was less than stellar and the Tina fey number was down right boring. The opening number was forgetful and none of the songs had a catchy enough melody to make you want to sing along. The Blu-ray extras followed along the same lines as the film, sadly. The longer longest Blooper reel in Muppets history was basically 15 minutes of Ricky Gervais laughing, which is only funny for about two minutes. Rizzo's biggest fan is quite simply stupid and the "I'll get you what you want" music video is boring after about one minute. 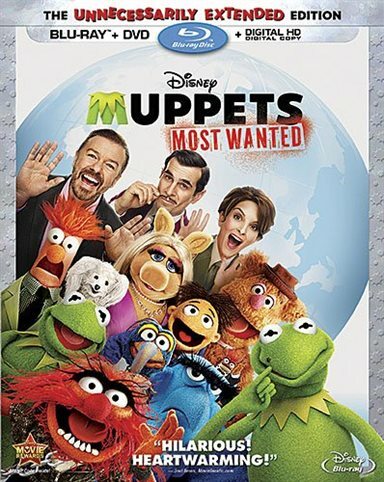 Download Muppets Most Wanted from the iTunes Store in Digial HD. For more information about Muppets Most Wanted visit the FlickDirect Movie Database.